Are you a food processor aficionado? You should be! This versatile kitchen gadget, while large, makes short work of many tasks and will earn its keep every time you entertain. Sarah is here to share some of her favorite ways to use the food processor, along with a simple and versatile recipe for Olive Tapenade that is sure to please your palate. Alright, Sarah, get us all mixed up in this food processor world! Greetings, entertainers. Let’s talk tech! I love kitchen gadgets, and when I was thinking around my kitchen for a favorite, one immediately sprang to mind. Not only is this gadget versatile, but it is easy to use, pretty noisy, and for me has some stress-relieving benefits. 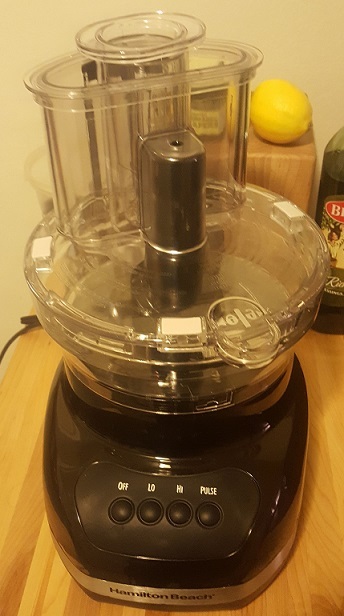 I am, of course, speaking of none other than the food processor! so it went in the class of kitchen gadgets I thought of in my head as “super crazy technical and awesome” (along with the mandoline). I only ever saw them being used on cooking shows, and seeing professional chefs use them for everything made me want one pretty badly. Fast forward a few years to when I finally put one in my own kitchen, and I’m a pretty happy camper. Do you want fresh salsa? Toss in a mango, some chiles in adobo sauce, and some fresh tomatoes. Run out of hummus halfway through the party? Never again. This thing is the king of dips, and as an added bonus, puts you in the front row to watch things being pulverized. One of my favorite things to make with a food processor is tapenade. 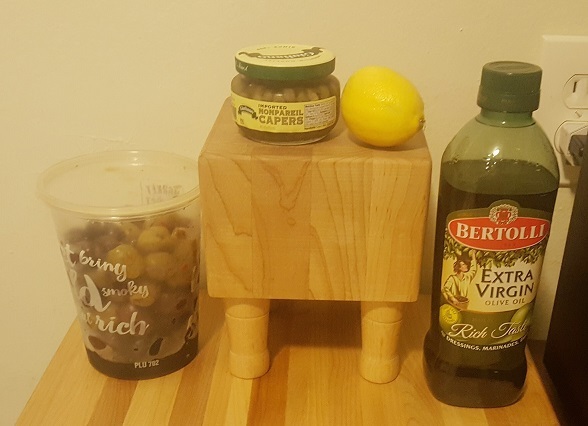 I usually have all the necessary ingredients in my kitchen, which mostly speaks to my love of olives (and anything salty). So let’s get down to it—how do we make this treat for your guests? Olives. I like to use a combination of olives from the olive bar at my grocery store, but if you have a favorite, that works, too. Kalamata olives make great tapenade that turns out a pretty purple color. The key here is no pits. Olive oil. Seems unnecessary, right? Wrong. Just a drizzle is absolutely necessary to getting your tapenade a smoother consistency. Lemon juice. Salt loves acid. Enough said. Assemble your food processor. For me, this means choosing the correct-size bowl, and determining which blade to use. I chose a smallish 4-cup bowl to keep my ingredients close together, and the standard chop blade that came with my machine. Some food processors offer doodads that julienne and add all kinds of awesome knifework to your ingredients. Olives are so small that it’s not necessary here. Add olives! I chose a mix of dried black olives, red pepper Spanish queens, and kalamata. I used enough to almost cover the bottom of my food processor, but for a party, you’ll want closer to 2 cups. Now capers. I used a heavy hand because I know I like the pungency. I wouldn’t use more than a teaspoon-full for guests. I squeezed half a lemon using another favorite gadget—a citrus juicer. Pro tip—put your citrus in flat side down so that the squeeze turns the lemon inside-out. Turn your food processor on low to blend your ingredients. I let it go about twenty seconds, or until the food stops moving around the bowl. Once your olives are all stuck to the sides of your bowl, turn the processor off, remove the lid, and scrape the sides. Now, the magic. Add a little bit of olive oil, and turn it back on low. I’d recommend about a tablespoon, or enough to keep the pulverized bits moving around the bowl as the machine goes. Do the check, scrape, add olive oil thing until your tapenade is the consistency you like, and then serve with pita chips or pita bread (I’m a sucker for pita bread with tapenade!). If you want to make it extra fancy, toast your pita in a pan on the stove first with a little butter. So what are your favorite kitchen gadgets? Any that were a childhood dream realized as an adult (I know I’m a huge nerd)? Happy entertaining, hosts! I am always ready for some delicious Oktoberfest food and beer! It’s too bad Oktoberfest doesn’t last all year. But if you’ve got a simple and delicious recipe, you can have Oktoberfest at home any time you want! 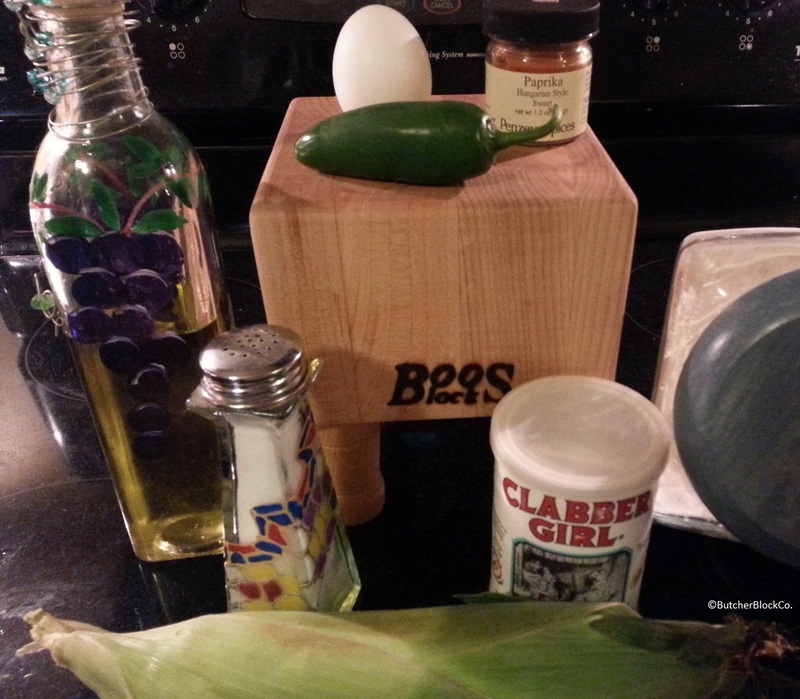 Claire is here to share just such a recipe, and I can’t wait to try it. Cheese us, Claire! Oktoberfest is just around the corner, and though I’ll be far away from the Bavarian tents, I am still on the edge of my American seat to partake of this year’s batch of Oktoberfest food and beer offerings. The official Oktoberfest in Munich is the largest beer festival in the world, and is in its 186th year! And what better way to get into the spirit of the fest than a party? I’ve been invited to just such a party this year by a very close friend, and unlike Labor Day BBQs with strangers, a German beer festival with friends is something I can fully get behind. This one is going to be potluck style, and this friend actually lived in Germany for a couple of years, so I worry that any Oktoberfest food I bring to the table will be judged pretty carefully. With this in mind, I spent a good couple of days combing over the German foods I could think up off the top of my head trying to decide what to make. My first thought was fresh pretzels, but honestly, even if I cheated with a bread machine for the kneading process, who really has the time to deal with the dough rise and the baking soda bath and everything else? But thinking of pretzels led me right to beer cheese. Pretzels and cheese is one of my favorite snacks, and if the cheese is good enough, I think we can excuse some store-bought pretzels. After a quick Google, I found a few recipes for Obatzda and headed to Trader Joe’s with a short list. I was also lucky enough while I was there to find some tiny Bavarian-style bratwurst, along with some apparently very traditional pumpernickel pretzels, if the cartoon German on the front of the bag is anything to go by. Let the cheese and butter come to room temperature. With a potato masher or a hand mixer, work the brie until it forms a pretty consistent blob. Add in the cream cheese, butter, onions, and paprika. Gradually add the beer until the mixture is your desired flavor and consistency. 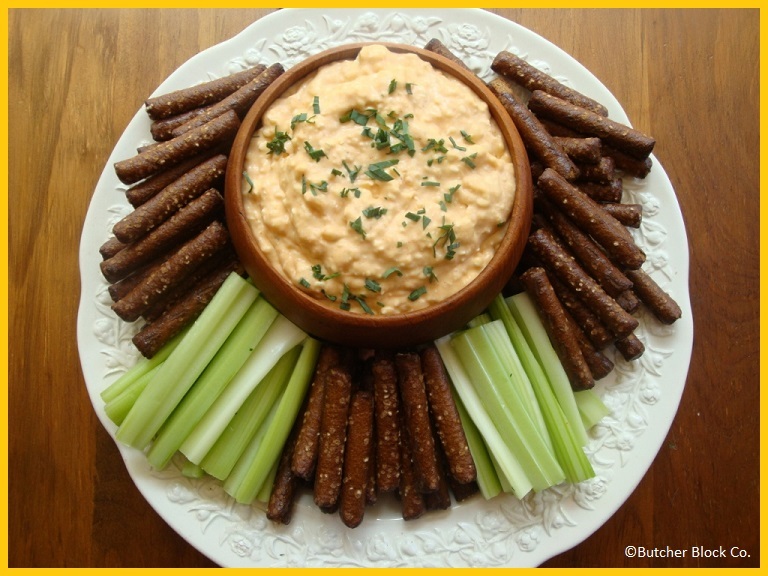 If you like a drier cheese spread, you can leave the beer out entirely, though you’ll certainly want to chill that beer and drink it heartily while you eat delicious cheese spread on pretzels or potatoes or maybe even slathered all over a traditional Bavarian bratwurst. I scooped my Obatzda into a little wooden bowl, garnished it with some chives from my front yard, and surrounded it with pretzels and celery (for color, mostly… no one is going to actually choose celery over pretzels, obviously). I am fully ready to drop this platter on a long table with some sausages, sauerkraut, and other Oktoberfest food, and raise a glass of liquid gold to friends and ‘fest! Shrimp Cocktail is one of my most favorite appetizers, and I am fortunate enough to have easy access to the best one I’ve ever eaten. My younger brother, Garrison Whiting, is the supremely talented chef at Counter Intuitive in Scottsdale, AZ. The menu at CI changes up every few months with the start of a new “episode.” The current episode is “Agua Caliente Racetrack,” which pulls inspiration from the famed horse racing track that opened in Tijuana in 1929 when drinking and gambling were still illegal in the states. The track catered to celebrities, and the spectacular menu at Counter Intuitive reflects that opulence in both food and drink. Back to the shrimp cocktail. Chef Garrison has concocted a delicious variation on a classic, and I would eat it every day if I could (I have almost two quarts of it in my fridge at the moment, so I will be living that dream for the next several days). 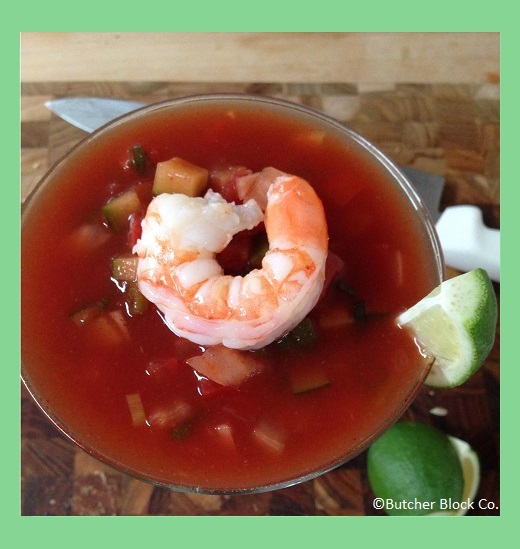 This isn’t your standard “dip shrimp in sauce” shrimp cocktail; this is more of the Mexican style that you eat with a spoon. Crunchy bites of cucumber and onion combine with the richness of avocado and bits of shrimp, all brought together by a spiced tomato cocktail reminiscent of a Bloody Mary. This Shrimp Cocktail is the best I’ve ever had, and you should definitely add it to your no-cook meal recipe arsenal. meals this week on Facebook, Pinterest, and Twitter, and this shrimp cocktail fits the bill if you use pre-cooked shrimp; even if you use fresh, though, it only takes a minute (literally) to cook them. The recipe below is in restaurant quantity (about 16 servings), but it is easily halved or even quartered if you’re not serving a crowd. I cut it in half and ended up with about two quarts. I always have shrimp in the freezer, so I’ve just been boiling up a handful every day and adding them into my individual serving in order to keep things fresh (I’m weird about seafood, okay?). Stir together all liquids and spices, then add veggies and let sit refrigerated overnight. In a large sauce pot bring 5-6 qts. of water to a boil with a handful of salt and a splash of white vinegar. Remove from heat and add the shrimp until they are just cooked (about 1 minute). Pour the shrimp into a colander and immediately transfer to a sheet pan to cool. Do not use an ice bath to cool the shrimp. To serve, cut up about 3/4ths of the shrimp into halves or thirds and place portions into large margarita/martini glasses. Ladle the cocktail sauce over the pieces and garnish with diced avocado, a lime wedge, and 1 whole shrimp. Serve with Saltine crackers. March Madness is taking over the world, and while I don’t really care about the sports part, I am HERE for the snacks! I will pretend to watch college basketball all day if you keep a steady flow of appetizers coming my way. Thankfully I have friends who love to feed people. Friends like Sarah, always ready with a tray of delicious treats. Today’s treats are wrapped in bacon, so you don’t need to worry about anyone not liking them. They’ll surely be a slam dunk! Okay, Sarah, the ball’s in your court! Greetings, foodies! I understand there’s some sort of holiday going on, but I CAN’T HEAR YOU – it’s March Madness time! I am really a one-sport woman, and NFL football has my heart, but I am also very competitive and enjoy beating my friends in basically anything that can be made into a game. My brother, the super-athlete that he is, first introduced me to the joy of winning, and as I grew up, I made friends who would invent new card games with me and run races and play backyard sports. As a bona fide adult, I am really, really drawn to fantasy football, but do you know what the worst part is? Changing your lineup every week! Figuring out when you’re allowed to drop and pick up players off the waivers! I took second place in a league this year without making any roster moves, which had the added bonus of annoying my friends to no end, but was mainly because I couldn’t figure out the waivers. So when do you host your March Madness bash? How do you theme it up? Tiny basketballs everywhere are a plus, but if you want to delight in seeing others bust their brackets while you conquer all, and have some tasty snacks while you’re at it, I’m advising a Mouth Madness party either during the final Sweet Sixteen games, or during the Elite Eight round. Have your friends bring a dish and face off in your own brackets for favorite bite of the evening. And if you want to… you know, win? Try these. Traditionally known as Devils on Horseback, these delicious things are easy to make (requiring just three main ingredients) and, if it’s possible, are even easier to eat. Also, the fanciest tools you need here are a baking dish and toothpicks. These Bacon Wrapped Dates are the perfect treat for your March Madness party! Cut your dates in half length-wise. Dates have pits in the middle that need to be removed anyway, and half a date is a much more manageable bite. Remove and discard your pits. 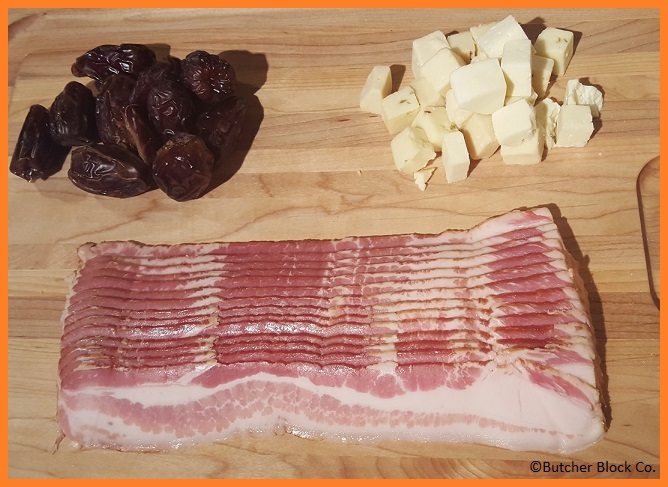 Roll half a slice of bacon around your half-date and cheese. Spear it with a toothpick to keep the bacon secure. Line these up in a baking dish (no need to spray it with cooking spray – bacon is GREASY!). Optional – Once you’re out of bacon or dates, or your dish is full, drizzle with balsamic vinegar and maple syrup (a little more vinegar than syrup), and pop in the oven at 375° for 40-45 minutes. Check these often in the oven! Depending on your bacon thickness, these could cook more quickly, and once you’ve burned bacon, it’s burned. Toothpicks are extra handy to move these things to a plate and serve while hot. Who’s in your Final Four? What’s your favorite March Madness match-up this year? Would you make these with turkey bacon, or nah? New Year’s Eve is the day on which a lot of us let loose a collective sigh of relief. The holidays are coming to a close and it’s time to party away all the stress that has built up. Do yourself a favor and follow in Claire’s footsteps on this one: make easy, prep-ahead, spectacular party food that will satisfy the crowd without causing you even the smallest amount of stress. We all know and trust Claire’s ability to feed people, but this menu is above and beyond the call of duty! She makes it all sound so easy, and assures me that it is. Claire, help us ring in the New Year! I love holiday cocktail parties! I love dressing up, I love champagne, and I love finger foods. Christmas and Thanksgiving are great for dinner parties, but a New Year’s Eve party is like the cherry on top of the holiday party sundae. Everyone has been through the holiday wringer by then, and they’re all ready to just throw down. If you find yourself hosting on New Year’s Eve, the best thing to do is stock up on the booze and put out lots of irresistible food to keep everyone grounded. My parents and my sister and her family are all going to be here for Christmas, and they are staying on through New Year’s. I get along really well with my family, and we are all really close. Even still, I think it’s safe to expect one or two flare-ups over the course of their stay, and I predict that by the end of it, we’ll all be ready for a little break, so I’m throwing a party to lighten our spirits. I’ve decided that I am going to go easy-route on everything for this thing. I’ve skipped party invitations in favor of a Facebook event invite, and I have a menu planned out that I can do almost entirely ahead of time, so I won’t have to miss out on any actual partying. The name of the game here is to keep everyone… not sober, necessarily, but sober enough that they will still be upright by the time that ball drops. That is why our menu will consist of rich and flavorful meats, cheeses, and breads. The more carbs and lipids your friends and family ingest, the more cushion there is to absorb all that Champagne. So let’s get into it! This year, I am serving toasted open-face prosciutto sandwiches, spiced lamb in puff pastry, and, of course, a cheese board. With the sandwiches, I think it’s better to keep it simple. You want people to feel comfortable walking around with these, so keep the ingredient list down, and the quality high. Just a thin smear of whole grain mustard, some Gruyère, and a slice of prosciutto on some very good bread is all it takes to have your guests coming back for more. The lamb puffs are a recipe of my own invention, and hot damn, am I ever proud of this one. In a small bowl, combine your panko breadcrumbs and milk. In a medium bowl, combine lamb with the shallot, a couple of shakes each of your dried spices, salt, and the milk mixture. As with many of my own recipes, I didn’t pay very close attention to how much of each spice went into the bowl, but I’d say approximately 1/8 tsp each. Then grate about an inch of peeled ginger into the bowl, and mix it all together until just combined. You can use a fork, but I think you get a better mix if you just go in with your hands. 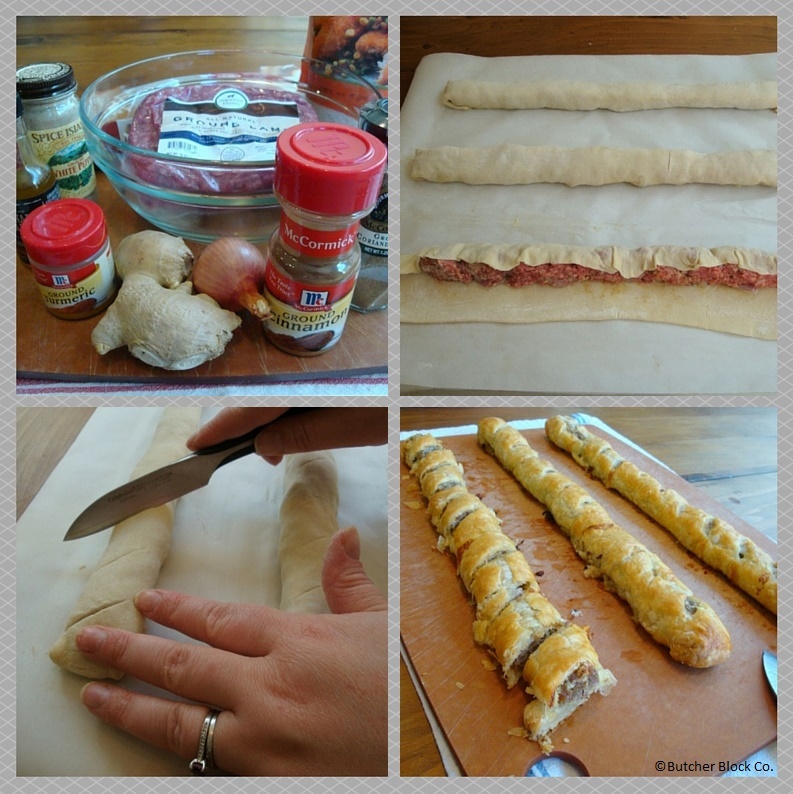 Roll the puff pastry out on a lightly floured surface until it is about 10 inches across and 14 inches long, and then cut it length-wise into three evenly-sized strips. Line a baking sheet with parchment paper and lay the pastry out on the sheet. Portion your meat mixture into thirds, and spread each one out in about an inch-wide stripe down the middle of each piece of pastry. Fold the sides over the meat and use the beaten egg to help seal it. With the pastries seam-side down on the baking sheet, cut small diagonal slits at one inch intervals along the top of each one and brush the tops and sides with the egg. If you are going to serve them right away, set the pan in the freezer to chill for thirty minutes before baking. If you are making them ahead of time, tightly wrap the entire sheet in plastic wrap before freezing. They will keep for up to two weeks in the freezer, and there is no need to thaw them before baking. When you’re ready to bake, preheat the oven to 425°. Bake the chilled or frozen pastries until they start to puff up, about 15 minutes, and then reduce the heat to 350°. Continue baking until the meat is cooked through and the pastry is golden and completely puffed up, about another 25-35 minutes. Transfer them to a cutting board and let them cool slightly, and then use your cuts as a guide to slice the pastries into one-inch pieces. Eat the ends yourself, because you want to keep a uniform look on your serving platter, and anyway, let’s face it, you just deserve it. For dessert, I am going super simple with a classic icebox cake and Champagne Jell-O shots. The Jello-O shots are so easy to make, and the wow-effect to work ratio is definitely in your favor. I used this recipe but there are actually dozens of recipes out there, and I’m sure they all work just fine. I will say one thing about these, though; don’t scrimp on the Champagne. Since it’s basically just Champagne and gelatin, you absolutely need to use a Champagne (or prosecco or any sparkling wine) that you would enjoy drinking on its own. The real dessert star here is the icebox cake. If you’ve never made one, get ready for your new favorite cake to make. The ingredients are as follows: Nabisco’s Famous Chocolate Wafers and homemade whipped cream. That’s it. I like to kick mine up a notch, and I fold some booze into the cream. It really elevates this simple dessert to a new level, and it’s so easy. In a large bowl, combine cream, sugar, and vanilla or liquor. I used Boulard Calvados, which is a really lovely apple brandy, but limoncello, Irish cream, Drambuie, or really any liqueur you prefer will work here. Whip the cream to stiff peaks. Carefully stack the wafers using layers of cream to bind them. 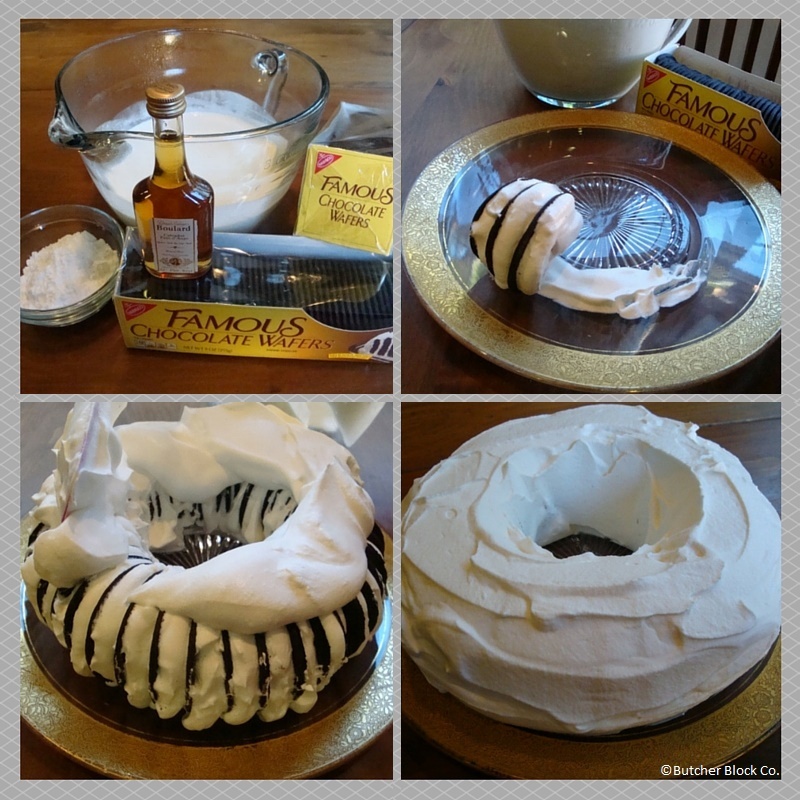 I made mine in a ring shape for a round platter, but you can shape it any way you like, even including that ultimate holiday dessert classic, a yule log. When you’re done stacking and shaping, use the whipped cream to cover the outside of the cookie log. There should be a little bit of leftover cream, which you should cover and reserve. Loosely cover your cake in plastic wrap and set in the fridge to chill for at least four hours, and up to 24. The wafer cookies absorb moisture from the cream and puff up, so when you are ready to serve, use the reserved cream to cover up any cracks in the cream or places where the chocolate has bled through. To get the layered effect, cut the cake at a deep angle so that the knife goes through several cookies. I like to serve my icebox cake with some kind of topping, like some Luxardo cherries or this incredible homemade cranberry ginger jelly. Happy New Year, from my kitchen to yours! This holiday season, let’s remember that the real reason we get together is not to get lit and embarrass ourselves in front of everyone we know. Enjoy your drinks responsibly, and when your family is about to push you over the edge, try to focus on the love. If that fails, just remember that you can always shut them up with a big mouthful of cheese! Thanksgiving is just a week away! Are you ready? I’m always ready for my favorite holiday, and this last week of anticipation can be brutal. This year I’m trying to focus that energy into making some awesome side dishes to share with my family, and I know just the place to find the perfect recipes – our very own blog! I am thankful for our extremely talented guest bloggers who have shared so many amazing dishes over the past year. Everything I’m bringing to the table this Thanksgiving comes from one of our posts. I bet you can find some inspiration here, too! Here is a collection of some of our most favorite recipes and tutorials for Thanksgiving. You’re sure to find something to be thankful for in this roundup of delightful dishes! 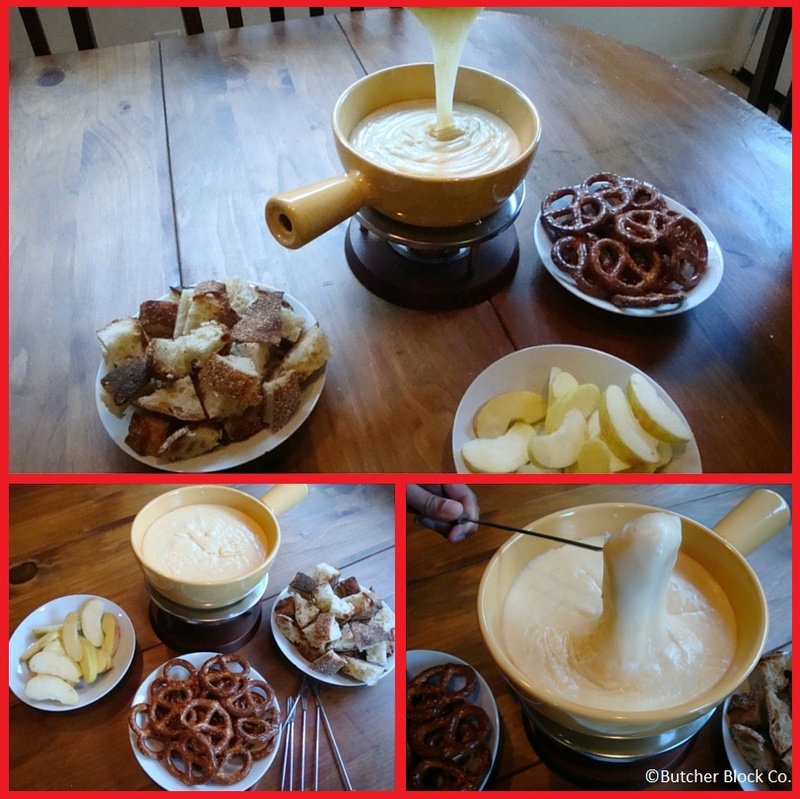 My absolute must-have dish is this Apple Cider Fondue that Claire shared recently. The whole family will love this alcohol-free pot of melty goodness. This Caramelized Onion and Apple Tart is always a hit. It’s easy to make and can be prepped ahead of time to save stress on Thanksgiving day. Carving the turkey is not my responsibility (another thing to be grateful for! ), but if you need help with the basics, check out this post from Chef J.
Brining is a popular method for turkey prep, and if you haven’t mastered it yet, this informative post will tell you everything you need to know! Need more veggies on your Thanksgiving table? We’ve got two wonderful Brussels Sprouts recipes here and here. For dessert, try this Chocolate-Pumpkin Bundt Cake, or my family’s favorite Chocolate Bourbon Pecan Pie. 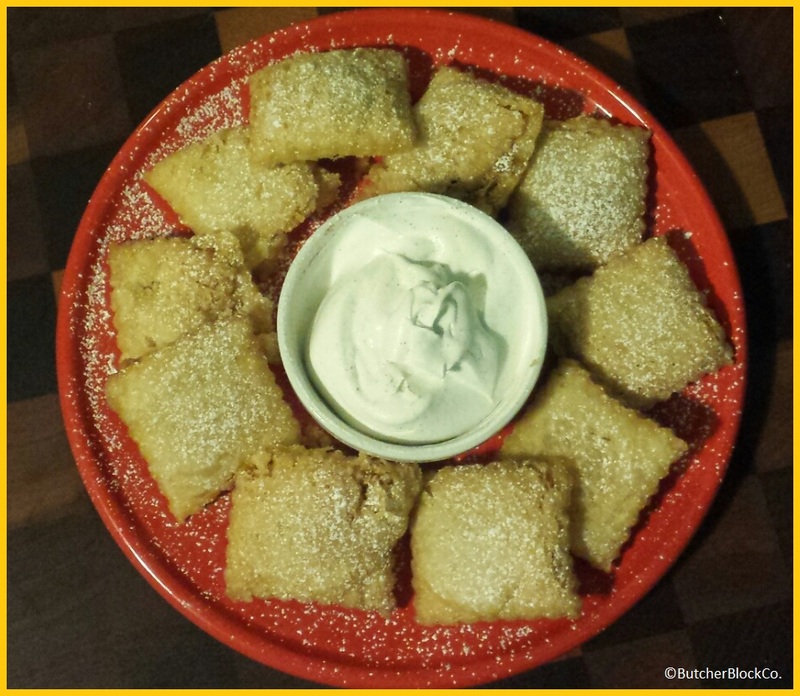 I’m going to play around with my Deep Fried Pumpkin Pie Bites recipe and hopefully perfect it by next week…although they were ridiculously good without being perfect! So, what are you bringing to the table this Thanksgiving? Did we inspire some great ideas? Let us know what you are thankful for this season and share with us your favorite Thanksgiving recipes. All of us at Butcher Block Co. are thankful for you, our wonderfully supportive customers. Have a happy, relaxing Thanksgiving! Fondue is one of my favorite things in the world because it involves melted cheese, and Claire is one of my favorite people in the world because she always has cheese and is always willing to share (I mean, there are plenty more reasons I love Claire, but let’s cut to the chase here). So it should come as no surprise to you that the following post has me crying at my desk. This combination of cheese plus Claire plus Fall flavors could not possibly equal anything less than spectacular. This is the kind of dish that makes it worth cleaning your house so you can invite people over. You don’t have to invite people over, but maybe cut the recipe down if you plan on keeping this to yourself (two pounds of cheese is a little much, even for me). Also, go ahead and clean your house anyway. I’ll pass this onto Claire now, so she can fill the cheese-shaped void in your heart. I love cheese. I mean, I really, really love cheese. I know loving cheese is sort of obvious, like loving bacon, but I still feel the need to openly state my affection for cheese. Before I moved to California, I used to be a cheesemonger. My cheese shop was attached to the deli in a local grocery store, and they brought me in to imbue the department with my passion and excitement for cheese and international cuisine. I was always sampling something out, engaging with my loyal customers, and bringing new people into my cheese fandom by virtue of my sincere love for cheese in all its many forms. After the first 6 months or so, I started searching for new ways to sample cheeses to my customers, and it was at that moment that my department started stocking fondue pots. It was autumn. It was miserable outside. It was meant to be. But there was a problem! Traditional fondues are made with alcohol, and my grocery store most definitely did not grant me permission to open bottles of booze behind the deli counter. I had to craft a new recipe for a fondue that would strip out the alcohol, but still be good enough to boost cheese fandom and sales. After just a couple of tries, I managed to put together a recipe that kept the traditional Swiss cheeses, but eliminated the wine and kirsch, and it was an instant hit. I handed out recipe cards, and sold through entire wheels of Gruyère and Emmentaler cheese in the span of two hours. Fast forward several years to my kitchen in California. It’s raining outside. The temperature has dropped a full 20° in the last three days, and it is finally starting to feel legitimately autumnal here. It’s making me flash back to those days in the cheese shop, and I am just craving hot, melted cheese. Luckily, my cheese shop recipe is so etched on my brain, I just throw a couple extra items on my grocery list, and I know I’ll be eating gooey, melty, soul-warming cheese in no time, and you can too. 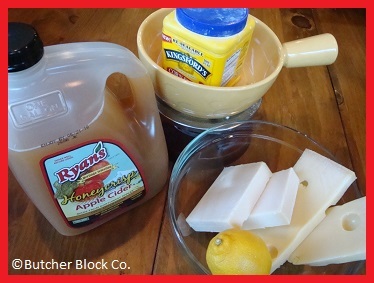 My Apple Cider Fondue is kid-friendly since it contains no alcohol, but maintains that smooth and creamy texture required to be a great fondue! Our base here is going to be Emmentaler cheese. If you’re unfamiliar with it, Emmentaler is what I refer to as the granddaddy of Swiss cheese. It is what all deli cheeses known simply as “Swiss” are trying to be, but they will never be as sweet and buttery as true Emmentaler. On top of that, we need something slightly nuttier to enrich our flavor, so we turn to our best friend Gruyère. I use approximately one pound of each cheese. Start by cutting off the thin rind and coarsely shredding all of the cheese into a big bowl. Next, gently mix 2 tablespoons of cornstarch into the cheese until it is evenly distributed. Press a clove of garlic and smear the inside of a pot with it so that the pot is completely covered in garlic juices. Pour 1 cup of apple cider and the juice from one lemon into the pot and bring it to a boil. Add in a handful of the cheese mixture and stir until it is melted. 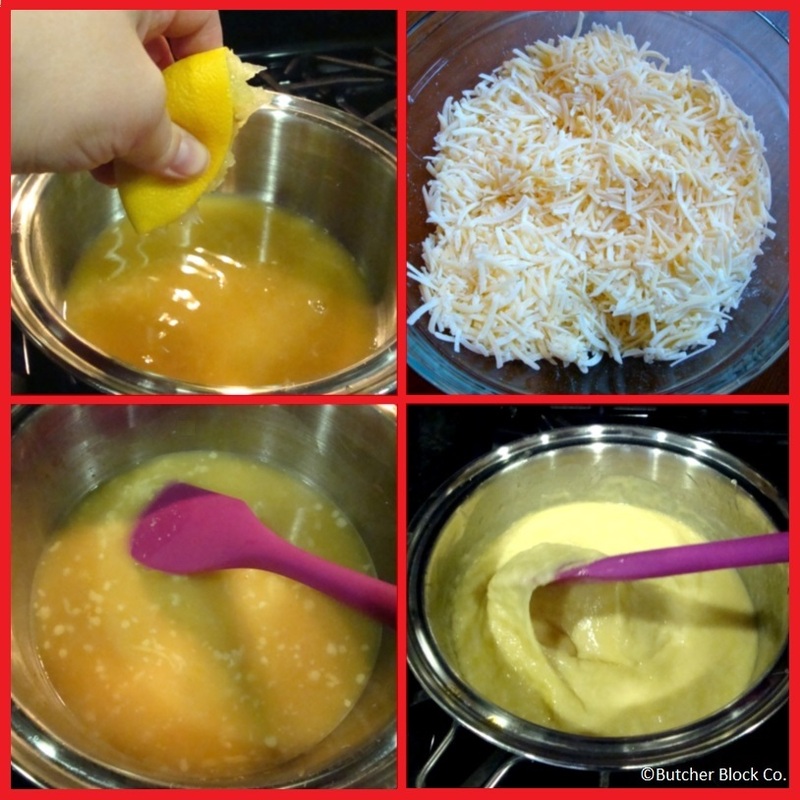 Gradually add in the rest of the cheese, stirring until it is a uniform texture. And that’s it! If you have a fondue pot, warm it before putting the cheese into it. If you don’t have one, a crock pot or electric skillet set on low will work. Serve your fondue with whatever you want covered in hot cheese. I like cubes of bread, veggies, pretzels, apples, or sliced kielbasa, but get creative! Half-way through our pot, we decided that we would like to coat our apple slices in fondue, and then wrap them in a slice of salami, and that was a good choice! Honestly you can’t go wrong here. Fondue does not keep well, so I recommend inviting friends to share it because you have to eat it all in one go, and nothing goes better with cheese than company! Gruyère a little rich for your blood? You don’t have to miss out on the melty, cheesy fun! I made an adorable and delicious riff on Charles Phoenix’s cheeseball recipe for my office potluck, and he was a total hit. Simply cover a block of Velveeta in cream cheese and set it in an electric skillet with a can of Ro*Tel. 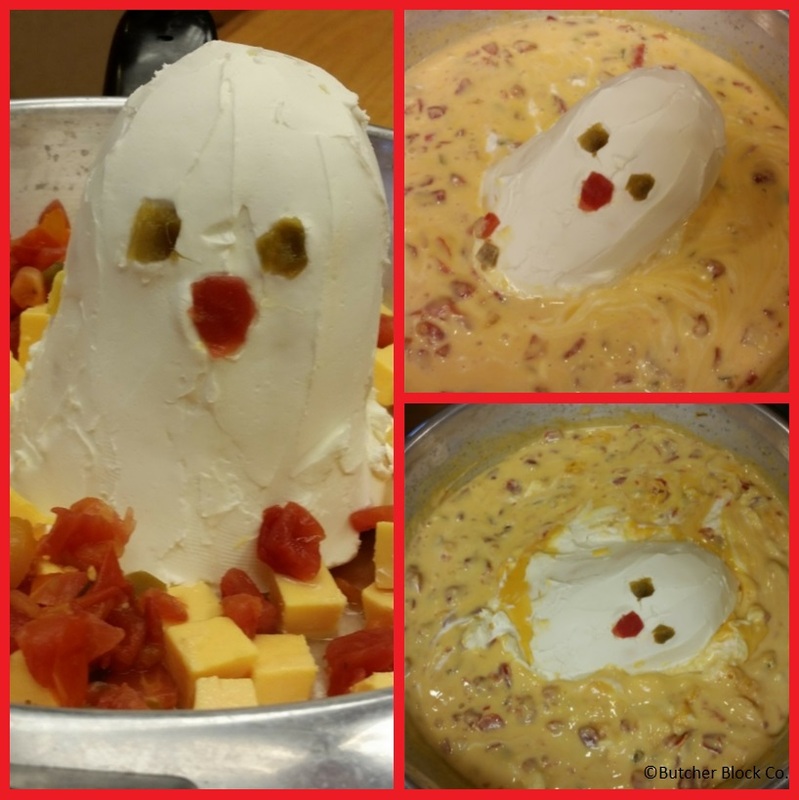 I shaped my Velveeta into a ghost for Halloween and named him Ghosty, but with Thanksgiving coming up, a turkey with a carrot and celery stick tail fan might be in order! Velveeta is surprisingly pliable, so again, get creative! This recipe is a great showpiece for a party, because watching the ball melt is half the fun. I really hope you’re not sick of pumpkin! I love pretty much all pumpkin-related food, so this is my favorite time of year. Last year we shared a pretty spectacular Chocolate-Pumpkin Bundt Cake (which you should seriously make right away), but I realized we had never done a pumpkin pie on the blog. The internet is pretty saturated with pumpkin pie recipes, though, so I’m doing something a little different (plus I am just really bad at making pies)! Since it’s October and the Fair is in town, I see no reason not to deep fry my pumpkin pie. These Deep Fried Pumpkin Pie Bites are the perfect way to serve up some pumpkin pie flavor with a twist. While searching for my ravioli cutter to make these little treats, I remembered that I actually have a ravioli maker (see pictures below). I’ve had it for probably 12 years and had never taken it out of the box, so I thought I’d give it a whirl. I wouldn’t recommend this unless you have the smaller one. Mine makes ten 2” raviolis, and they were just a bit too big for this application. If you have the one that makes 1” or 1.5” raviolis, that will work much better. If you don’t have one at all, though, don’t worry! Just mark off your dough in 1.5” squares and put a dollop of filling in the middle of each; place another sheet of dough over the top and gently press down around each side of the filling; cut along the seams with a sharp knife and crimp the edges with a fork. Alternatively, do these however you want (round, square, with a cookie cutter or empanada press)! There’s not really a whole lot that can go wrong as long as you properly seal them. I used premade pie dough because pie scares me, but feel free to make your own favorite recipe. You could even use an empanada or pizza-type dough – whatever you like. The trick is to roll it out thin enough that your pie bites will fry quickly without getting oil-logged. I’m not going to complain about how incredibly flaky mine were, but I probably should have rolled the dough out to about half its original thickness. Refrigerate your pumpkin mixture while getting your dough ready. This will help it set up a bit so it is easier to work with. Test your oil with a scrap of dough before you commit to putting the real thing in the pan! Your oil should react immediately with vigorous bubbling, but you don’t want it so hot that the dough burns before it finishes cooking. Using a whisk or electric mixer, combine pumpkin and cream cheese until smooth. Mix in spices and sugars. Refrigerate while preparing the rest of your ingredients. Heat about a half inch of oil in a heavy-bottomed pan (a Dutch oven works perfectly for this) over medium to medium-high heat. On a lightly floured surface, roll your pie dough to about half the thickness you would use for a full-size pie. Using your preferred ravioli-making method, assemble your filling and dough into 1.5” mini pies. Test your oil temperature and adjust accordingly. Fry your mini pies in batches, depending on the size of your pan. Do not overcrowd the pan! Flip the pies once the bottoms are golden brown. They’ll take 1-2 minutes per side. Drain on paper towels. While your pies are draining and cooling slightly, whip your cream however you like it (or use pre-made…I won’t tell!). Fold in cinnamon to taste. Arrange your mini pumpkin pies on a serving tray and dust with powdered sugar. Serve with cinnamon-spiced whipped cream. Cry over the deliciousness. Leading up to my visit to Claire’s, I was so excited for all the delicious food, but I had no idea our little friends luncheon was going to be so grand! Working on a fabulous meal together was the perfect way to catch up with out-of-town friends. I can’t wait for our next get-together! 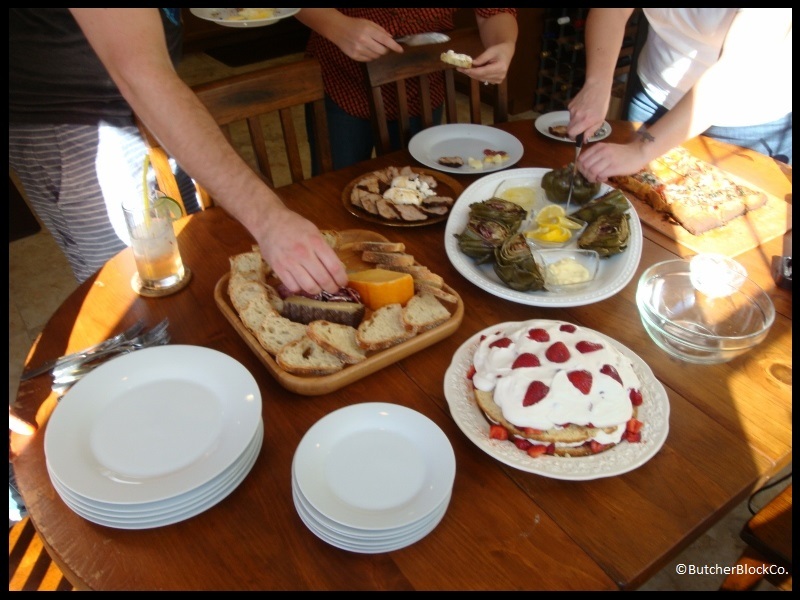 If you are thinking of planning a friends luncheon of your own, read on for some fabulous recipes and tips from Claire. At this point, I think my love for hosting has been fairly well established, so for me, nothing beats having friends over for a weekend stay. I enjoy all parts of the process, from the planning stages up. I gleefully plot out a menu and a rough list of possible activities, carefully tailoring each visit to my guests’ particular tastes, and being sure to plan for several hours of doing nothing at all in order to establish a truly vacation-y vibe. Also, depending on the previous night’s activities, sometimes sitting around doing nothing is exactly what we need. This past weekend, I had the pleasure of hosting several friends at once. Andrew and Meredith drove down from San Jose, and Candi made the trek up from Phoenix with her 9-year-old son. I made the long haul to several grocery stores. For a get-together like this one, I like to keep the fare simple, but impressive. I planned the weekend menu around dishes that wouldn’t take too many ingredients, and that wouldn’t clash with each other on my cooking surfaces. 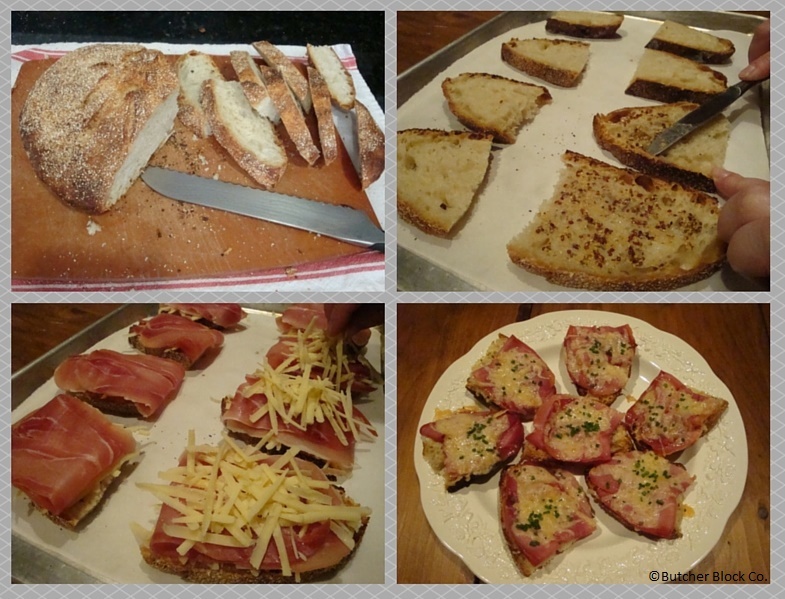 My guests rolled in late Friday evening, so I threw together a basic cheese board with fresh bread, and we sat around it munching while we caught up. Saturday morning, I made buttermilk biscuits and sausage gravy, and since we had such a heavy breakfast, we decided to make our next meal a late luncheon. For the next several hours, we sat around laughing and digesting, and remembering why we all had so much love for each other, while planning out our friends luncheon. I settled on making a roasted pork tenderloin, because it can be easily sliced into small servings, and it’s a fairly simple cooking process. We also had a trio of artichokes, another cheese board (because there’s no such thing as too much cheese), and one of my favorite crowd-pleaser recipes, tomato pie. For a dinner party, I usually like to have everything basically ready by the time my guests arrive. In a sleepover scenario like this, though, it’s much more fun when everyone hangs around the kitchen and helps, so I planned around each of my friends’ kitchen strengths. Andrew quickly got to mixing cocktails while I pulled ingredients out of the fridge. Candi, who, incidentally, is a fire wizard, went out to the patio to get the grill going while I started prep on the artichokes. Mer tested the cocktails and cheeses for quality control. For the artichokes, I squeezed a couple of lemons into a big pot of boiling water and dropped them in, then threw in the halved artichokes. After about 15 minutes, I checked them to make sure they were done, and then gave them to Candi. She slathered them in a mix of olive oil, lemon juice, kosher salt, and pepper, and finished them on the grill to char up the edges a bit. We put them on a platter with bowls of butter and mayo for dipping. Our friends luncheon was coming together nicely, but surveying our progress, I realized that we were missing a key ingredient: dessert! Luckily, I had just bought a giant box of strawberries, so I put Candi to work hulling those while I threw together a shortcake. My recipe of choice comes from my grandma’s copy of Cross Creek Cookery, by Marjorie Kinnan Rawlings, and it is pure perfection. While the shortcake cooled and the oven was still hot, Andrew took a break from mixing cocktails to work on the pork tenderloin. He put together a mixture of dried herbs and spices from my pantry, rubbed down the tenderloin, and threw it in a hot skillet. After he got a good sear on all sides, he put the skillet into the 450° oven and let it roast for about 18 minutes. Then he covered the pan in foil to let the meat rest while we prepped the tomato pie. At this point, our friends Jess and Ian showed up. My husband and Ian loaded Candi’s son into the car and headed out to play some disc golf, and not a moment too soon, because Andrew’s cocktails were starting to catch up with us. Our 90’s hip hop dance party heated up while we waited for timers to ring. When the tomato pie finally came out of the oven, we were ready to get to the grub. We put everything out buffet style, set out plates and silverware, and sat around the table inhaling the fruits of all our hard work. In our case, the tomato pie was maybe a little darker around the edges and the pork just a little more done than planned. That’s just what happens when you ignore the kitchen timer because you’re in the middle of a dance-off. Anyway, the best foods are flavored with laugh-attacks. Preheat your oven to 400°. On a lightly floured surface, roll the puff pastry out to desired size; I like to fit mine to a stoneware baking tray, but any cookie sheet or pizza stone will work. Bake the pastry for about 15 minutes, until it is golden brown, but not quite done. Spread the mustard evenly over the pastry, then layer on the cheese, basil, and tomatoes. Pop back into the oven and bake until the cheese is melty and the tomatoes are cooked, about 10 more minutes. Butter a round cake pan and set it aside. Preheat the oven to 400°. Mix the first five ingredients together and sift. Cut the butter into pieces and quickly work it into the flour mixture with your fingers. Add the egg, and then milk. Mix quickly and turn the dough into the cake pan and pat it into shape with the flat of your hand. Bake the shortcake for 20 minutes and then turn it onto a cooling rack. Set aside a few of the largest strawberries to top the finished cake, and cut the rest into pieces. An hour before you’re ready to eat, add the brown sugar. Let the berries sit in the bowl for about an hour in a warm place, stirring occasionally to make sure they are macerating evenly. Cut the shortcake into two layers and butter each cut side. Pour the cream, vanilla and 1 tablespoon of sugar into a tall bowl and whip until stiff peaks form. To assemble, stack the cake layers together with strawberries and juice between and on top. Top with whipped cream and decorate with reserved berries. Well didn’t we get lucky? 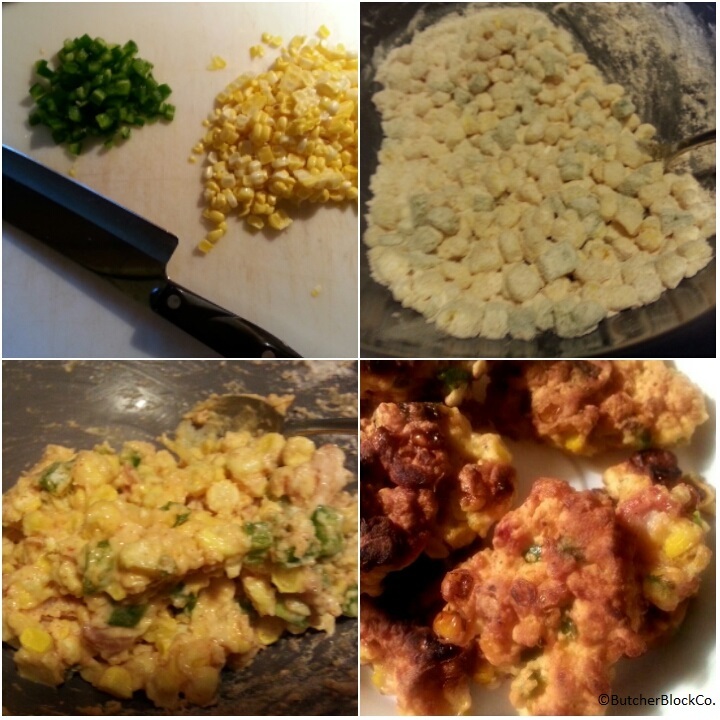 Our Meatless Monday blog just happens to fall on National Corn Fritter Day! I am sitting here drooling thinking of all the Meatless Monday dishes that could benefit from a delicious Jalapeño Corn Fritter – vegetarian chili, a big hearty salad, vegetable stew! I’m super excited about these! Sarah W. was brave enough to fry in her own kitchen, but I think I would break out the electric skillet and do these outside (I have a very real fear of indoor frying. We’ll save that story for another time.). These look easy enough that even I could make them, and Sarah has a bunch of suggestions for customizing them to your personal taste, whether you’re making them for Meatless Monday or just because. Sarah, teach us the way of the Corn Fritter! Happy Corn Fritter Day! When Candice told me this was a thing that really exists, I knew I had to find a great recipe. I have no personal attachment to corn fritters, but as a Midwest resident, I know and love me some sweet corn. Today’s recipe is simple and doesn’t require any crazy impossible-to-find ingredients. Meatless Monday meals can be as simple or as gourmet as you like, and these Jalapeño Corn Fritters fit in nicely no matter where you fall on that spectrum. 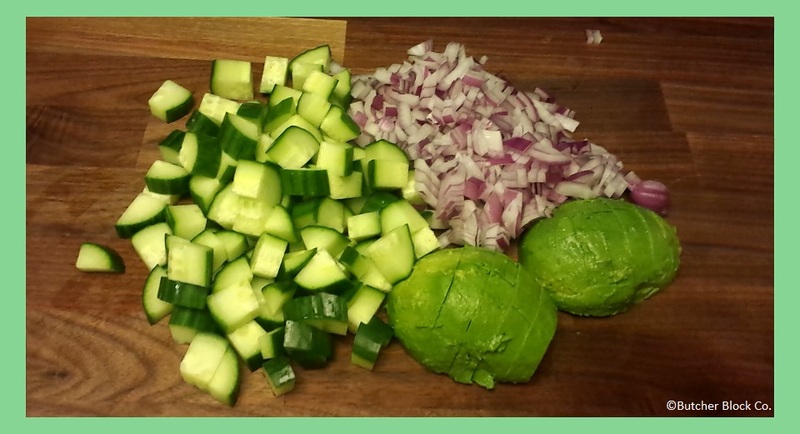 Summer for me is about simple food that’s easy to prepare (and preferably has a little kick). I added some finely chopped jalapeño to give my corn fritters an additional dimension of flavor. Typically, Midwest summers are hot, sticky, humid, and best spent lounging by the pool, but this year we’ve been given something of a reprieve. It’s very odd to wake up to a crisp mid-July day, but hey – I’ll take it! The fact that the weather eased up made it easier to think about tackling a dish that requires a hot stove. We all know I love shortcuts. This recipe is fairly straightforward, so there’s not a lot of room for improvement, but I will say a few things. Adding jalapeño was a fantastic idea. If you’re not making these on a Meatless Monday, toss some bacon in there, too. Summer is growing season, and hot peppers are one of the things that have historically grown best for me (they don’t need very much attention). If you have a hot pepper other than jalapeño, use it! If you have frozen corn instead of fresh corn, use it! If you are using fresh corn and have access to a grill, try grilling your corn before slicing it off the cob. This recipe calls for paprika, but to be honest, I am not very good at being able to taste paprika in things. If you want to spice this up with additional favorite seasonings, do it! Rosemary (my perennial favorite) would be great, as would fresh cilantro, lemon pepper, a little red onion, maybe even garlic (be careful with fresh garlic – it burns easily). My point (as always) is: this recipe says to make this dish a certain way. Fortune favors the bold, so modify, modify, modify, and don’t be afraid to add flavors you like! 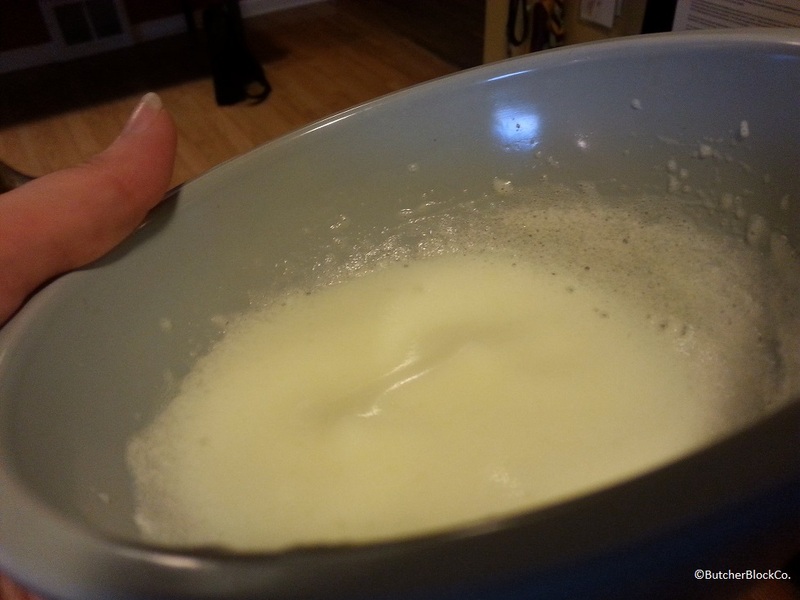 Also, use a mixer to beat the egg white – don’t try to be a hero like me and whisk it by hand for five straight minutes until your arm cramps up before conceding defeat and digging out the hand mixer. It’s a much better choice, I assure you. Remove corn from cob, if using fresh. Chop your jalapeño pretty finely. Combine flour, salt, baking powder, and paprika. In a separate bowl, beat the egg yolk, then add your corn and jalapeño bits. Add your dry ingredients to your egg yolk, corn, and jalapeño. This is going to coat it and make what appears to be corn gravel. Go with it. Beat the egg white until soft white peaks form. The photo above should give a decent reference of “soft peaks”- if your egg doesn’t hold a little bit of shape when you pull your beaters out, you’re not there yet. Once you’ve beaten your egg into submission, fold into your corn gravel. You should have a super sticky mixture, but the egg white should be enough wetness to incorporate all your flour. If your dough is too dry, add a tiny, tiny, TINY bit of milk. I didn’t need to do this, but thought I would until I mixed and scraped the bowl for a few minutes. Heat oil in a skillet. Drop dough into pan by rounded teaspoons, flattening slightly once they’ve hit the oil. Fry until golden brown on both sides, flipping once. Pretty easy, right? I have an innate fear of frying things in oil on the stovetop, and these went pretty well. Make sure your oil is heated so your fritters sizzle once they hit the pan. Use a kernel of corn from your dough mixture to test before dropping a whole batch in. Using rounded teaspoons, I came out with 9 palm-sized fritters, so adjust the size or double the recipe as needed. I’d recommend frying 3-4 at once, depending on the size of your pan, and using the back of your spoon to flatten these when you drop them in so they cook evenly. Be warned that corn + hot oil can mean popping or spitting. Corn naturally has some water content, so be cautious. These are a great treat, crispy on the outside, with the sweet notes of the corn and the spiciness of the hot pepper on the inside. Great with a cold beer on the patio on an unseasonably cool summer evening. What’s your favorite Meatless Monday recipe? Are you as deathly terrified of frying things as I am?